Share in $5000 every month with our Friday Score promotion! 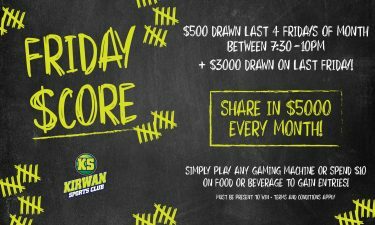 $500 drawn on the last 4 Fridays of the month between 7:30-10pm, and a huge $3000 drawn on the last Friday! 20 names will be drawn each Friday, and at the end of the month those 80 names will be in the running to win $3000. Simply play any gaming machine or spend $10 on food or beverage using your membership card to earn entries. Information for members and guests. Must be present to win. Terms and conditions apply. Call 4773 1223 for more information.